DirtyTrailShoes : Scott Noack's Running Blog: Training : Is regular exercise / improved eating habits worth it? Review of lab results over two year time span. Training : Is regular exercise / improved eating habits worth it? Review of lab results over two year time span. I can honestly say that after two years of constant exercise and modified diet of more vegetables, fruit, less refined sugars/grains that I not only feel healthier but lab results confirm I'm incrementally healthier. Time to celebrate with a beer! Before I get too interested in my beer, let's review where I started. Two years ago my youngest son and I spent the summer at Lair of the Bear camp up in Pinecrest and to make a long story short I met an older gentleman who held his own on a demanding 10 mile hike out to a pristine lake and back to camp. I asked him at the lake what his secret to apparently boundless energy and he said back in his native San Francisco (he was retired teacher/professor) that he has always enjoyed running, eating healthy and in moderation. I thought about that for awhile and thought my God I also want to be able to hike when I'm in my 80s. Two years ago I weighed 168+, had elevated triglycerides and low good cholesterol from a mostly sedetary lifestyle. I pretty much thought of exercise as what you do to get from house to car to work and back. Eating healthy meant only having two donuts instead of four. You can see from column '2012' that although my results were not too bad they certainly were not good. I was also putting more and more weight on mostly in places I didn't want it to go. Wearing shorts around the pool or beach was becoming more and more of a self conscience experience. So within a week of returning from Lair I grabed my son and said we're going to run every day and get in shape. I got a look like 'Yeah right!'. The next morning I made it exactly one mile around the neighborhood block before I nearly passed out in a pool of sweat. My entire body hurt : my lungs hurt, my sides hurt, my feet hurt, my knees hurt. Everything hurt. But, I also felt strangely accomplished and wanted more. Since that painful first mile, I've run consistently for two solid years. I've made many newbie mistakes, learned more experienced runners and can honestly say I feel fantastic. 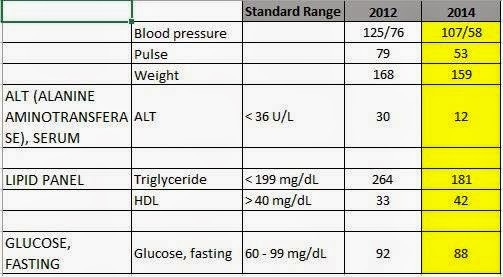 From recent results below (see '2014') I have some hard test results to show I actually AM healthier. Most notable are blood pressure, resting pulse and Triglycerides. They just drop like a rock in a good way with routine exercise. Good Chrolresterol, HDL, also gets better. You might think, "Well you also changed your diet maybe you've sacraficed all the good things that you loved to eat!" Not true. My appetite is just as large and I eat hambergers, donuts and oh lorde do I drink BEER! I just eat/drink less than before and have a means of burning off all those calories. Exercise! So, get off the couch, put the donut down, dress in your power work-out cloths, slip into those running shoes, grab some friends and get out there! Yes, it really is worth it and no you don't need give up your favorite foods just eat in moderation. It seems that diet gets all the media attention, but that is only half the story. Diet + exercise is the way to go. Thanks for sharing.